To fully retain the characters while saving it on a CSV format and to somehow be able to import/re-use the data in the future. You can follow these steps. In Microsoft Excel, open the *.xlsx file. Select Menu | Save As. Enter any name for your file. Under “Save as type,” select Unicode Text. Open your saved file in Microsoft Notepad. Replace all tab characters with commas (“,”). Open the “Find and Replace” window (Press Ctrl+H) and replace all tab characters with comma . Name the file, and change the Encoding: to UTF-8. Change the file extension from .txt to .csv. Open the .csv file in Excel to view your data. The passwords for all accounts on OSX 10.11 El Capitan, OSX 10.10 Yosemite, OSX 10.9 Mavericks and OSX 10.8 Mountain Lion including admin and standard user accounts can be reset and changed when booted from theRecovery Partition on OSX. Reboot into the Recovery Drive by choosing the ‘Apple‘ menu > Restart, hold down the ‘command’ + ‘r’ keys on the keyboard during the start up process when you see the start up screen you can let go. When the machine boots eventually you will see the OS X Utilities screen. 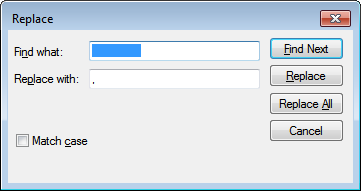 This launches the Reset Password screen, select the Volume Hard Drive in the top part of the window pane, then for the user that you need to reset select the user account in the lower part then add and confirm the new password and click save, you get a confirmation screen and details about the keychain account. Go to the Apple Menu and click Restart to boot back to the normal hard drive and the new password will take effect immediately. Find out how to perform a soft reset on your device, just follow these simple steps. Press and hold the Power button and the Volume Up button at the same time. The device will vibrate 3 times, release the power and volume up buttons. The device must be powered on manually after the soft reset is complete. The soft reset has been completed. On the Sony Xperia Z3 Compact, the small yellow reset button (OFF) is placed under the cover for the nano SIM card holder. Press the button with the tip of a pencil or a similar object and hold it down for 5-10 seconds. After a series of quick vibrations, release the restart button. Don’t use any sharp objects or press the button too hard, otherwise you can damage it. Then turn on the phone in the regular way by pressing the power/unlock button. After the restart all settings and personal data such as contacts, music, photos and other files will stay intact. (A) OPENING QUESTIONS: Opening questions will be asked toward the beginning of an interview. These questions set the stage for more detailed discussions and have most profound impact in the decision making process. Generally, are subtle in nature but carry most weightage. Things like “Please tell me about yourself or please introduce yourself”. The goal of this phase is to acclimatize the interviewer as well as interviewee with each other, provides an opportunity to introduce each other, and is the suitable time for an interviewee to give a snapshot of his/her career, what is commonly known as ‘Elevator Talk’. (B) PROJECT-BASED QUESTIONS: As a consultant most of the work we do is project-driven i.e. we are assigned a project with a definite start date and end date, we complete it and then move on to another project or another phase of the same project. So it becomes very obvious for anyone to ask “What was your most recent project all about?” or “Can you please tell me about your XYZ project?” I recommend to prepare a cheat sheet with the following things and use it to prepare of an interview. Oftentimes, despite working on a project, we may not be able to recollect the key information during the interview, especially for the projects we completed 2-3 years back. Preparing a cheat sheet will go a long way. (C) TECHNICAL: This phase of an interview is where an interviewee’s core knowledge on the subject, tools, technologies, artifacts, documentation etc is tested. The objective of an interviewer is to validate your knowledge on the subject. Since I am writing this article from the ‘Business Analysis’ perspective, you may expect questions such as below. (1) What is BPMN 2.o? (2) What is ‘Gap Analysis’? (3) How do you write a ‘User Story’? (4) What are the different ways to split an EPIC into small user stories? (5) What is a pre-condition in a use case specification? (D) BEHAVIOURAL: I personally believe that this is the most important phase since this is where your true character comes out. Since this phase focuses on your overall personality, behavioural traits, aptitude, sense of humor etc, there is no way you can truly prepare from any textbook or sample set of questions. It just doesn’t work that way. It’s how we have been groomed over the years. For example, in my very first interview of my career, I was asked “How would you have reacted if after reaching here (I had travelled 200 miles for that interview) you were notified that the interview is cancelled?”. At another instance, one of my candidate was asked “Why do you like your job?”. These are very subjective in nature and hence can’t be termed as right or wrong answers. (E) CLOSING: As part of the closing phase, you may reinforce all your selling points and make closing remarks. Also, you may ask questions to your interviewer on the project, team structure, tools used, requirements processes, tentative project initiation date (if not yet initiated) or , if selected, what is the expected starting date etc. It will leave a good impression on the interviewer since you are already showing interest and eager to work with the project team. Recognizing each of these phases and what type of questions to expect in each phase will alleviate lot of stress and anxiety. More importantly, it will give you great amount of confidence in answering your questions since you were already expecting them. This has really helped all my trainees and hopefully will help many others. Duplicating posts is a very useful functionality when you work with a lot of similar posts (for example products in online shop). Especially if the posts have the same custom fields values, but the different post title and content. It means that you do not have to re-enter custom fields, post tags and categories each time. When you click the «Duplicate» link, the post will be cloned, but it won’t be published, it will be saved as a draft and you will be redirected to the post edit admin page. This is enough easy to do, so, look at the following code, insert it into your theme functions.php file (or into the another file if you know what to do). #1 – You get to make the world a better place. If you can solve even just a few problems and help a few people understand each other better, you’ll have done your good work for the day. #2 – You get to help smart people communicate. There’s no doubt that you work with some awesome people. Yet, without your help, they still seem to talk past each other. As a business analyst, you get to jump right in and facilitate some amazing, collaborative working sessions. #3 – You get to ask the tough questions. Seriously, you get paid to ask the difficult, challenging questions that no one else wants to ask to make sure that the project goes more smoothly and truly solves the underlying business problem. #4 – You don’t have to be super techy. Sure, you like to understand how the latest and greatest systems work, but you don’t have to code them or even understand them in a super-detailed way. #5 – You get to learn. Business analysts never stop learning. New domains. New stakeholders. New techniques. New approaches. There is always something new and interesting to do around the next project corner. #6 – There is no shelf-life on your skills. But at the same time, the business analyst skills you build like facilitating, problem solving, and leadership will serve you in your life-long career. The facilitation technique you learned as a junior BA can be just as applicable on your 100th project as it was on your 1st. #7 – The salaries are rising. Consistently. We are seeing salaries upwards of $90K in the US for mid-to-senior level business analysts. #8 – The role is on a rising tide. Every day, the business analyst job role is becoming more widely recognized, the opportunities are growing, and the role is expanding. Yet, as a profession, business analysis is still new enough that you’ll be starting when things are fresh. What do you love about business analysis? 1) Click the Start Orb at the bottom left of your screen. 2) Type ncpa.cpl into the search box and press ENTER. 3) Right-click your Local Area Connection and select Status. 4) Click Details and the Physical Address is your MAC Address. 1. Click on the Windows Logo in the bottom left corner. 2. In the search box, type in cmd and press enter. 3. In the command prompt, type in getmac (with no spaces) and push enter. 4. The MAC address is labeled Physical Address (denoted by a yellow box below). So I had a request to add a super big menu in WordPress, and some sub menu’s and then after configuring the menu and clicking save half my menu disappeared. Apparently there is a limit that is set. This limit is not imposed by WordPress but by your web hosting server because of some security reasons. In PHP, there is a thing called post vars that controls menu items. By default maximum post vars are much limited as most of the websites require only a few menu items. This is the one that worked for me! Hopefully one of the method should work for you. The WordPress Menu Item Limit or: Help! Half my menu items just disappeared! Step 2: Select Bookmarks > Bookmark Manager. Step 4: Select Export bookmarks. Chrome will export your bookmarks as an HTML file, which you can then import into another browser. Click Start, point to Programs, and then click MS-DOS Prompt (or Command Prompt in Windows NT). NOTE: The text file that you create is located in the folder that you are in when you follow these steps. In the earlier example, the Windowsfolderlist.txt file is located in the Windows folder. Use a text editor, such as Notepad, to view or print this file. A little about me - Experienced senior Business/System Analyst with Project Management Experience and a flare for design. I've also got a couple years ESL instruction experience. Dream, Dedication, Determination, Direction and Destination. No tweets found from "ahmedv"